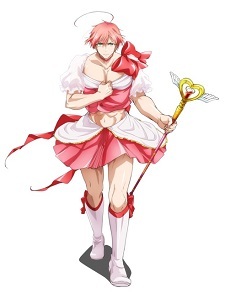 The official website for the upcoming Mahou Shoujo Ore TV anime has announced additional staff members. A new PV was also revealed. Animated by studio Pierrot Plus, the anime will pre-air the first two episodes of the series on March 25 via AT-X, but will officially broadcast on Mondays 10:00 p.m. via AT-X, followed by Tokyo MX starting April 2. The two artists who will be involved in performing the ending theme song's chorus are also involved in producing the song. Ogata, a.k.a Em:óu, wrote the song's lyrics and U-ya Asaoka composed the song. Additionally, U-SKE Asada is in-charge of the song's music arrangement. PV2 too much feels. More magical boys incoming in high heels? I'm so ready. Oh yeah. A magical girl anime for MEN! Thought the ED was going to be by Hatano and Ishikawa since they're an idol group in the story too, right? Well the male forms. But hearing more Toshiyuki is good too, was surprised by Yusa though. That PV though, I wonder how dumbfounded this series will make me. I don't know what it is but I have to watch this. Magical boys should be a thing after Binan boys. I swear.